At four am the light came on in the room serving as our bunk house. “Good morning, coffee is on the table,” said Zvonko (zVON-ko). 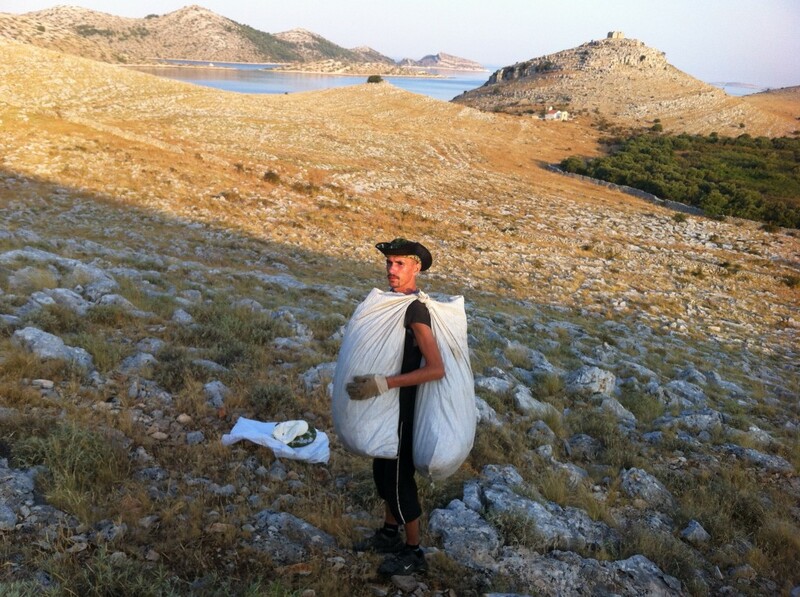 In Croatian, Zvonko means ‘bell ringer.’ I can think of no better name for the person who is waking us up at four am to climb up the mountainside to pick sage in one of Croatia’s most remote archipelagos, the Kornati islands. Our goal on this day was to climb up the mountainside to cut sage that grows on the rocky slopes all over the steep hillsides. The sage, or Kadulja (KAD-ool-ya), is processed into oils and other products, including the fresh spice that can be bought at markets. I had asked Zvonko if I could visit his place on the islands and possibly plan a trip with our students here next year. The idea we had for the Kornati Adventure was to come to the islands by traditional sailing craft, work with Zvonko and his family collecting sage and sail home the same way people had been doing for generations. 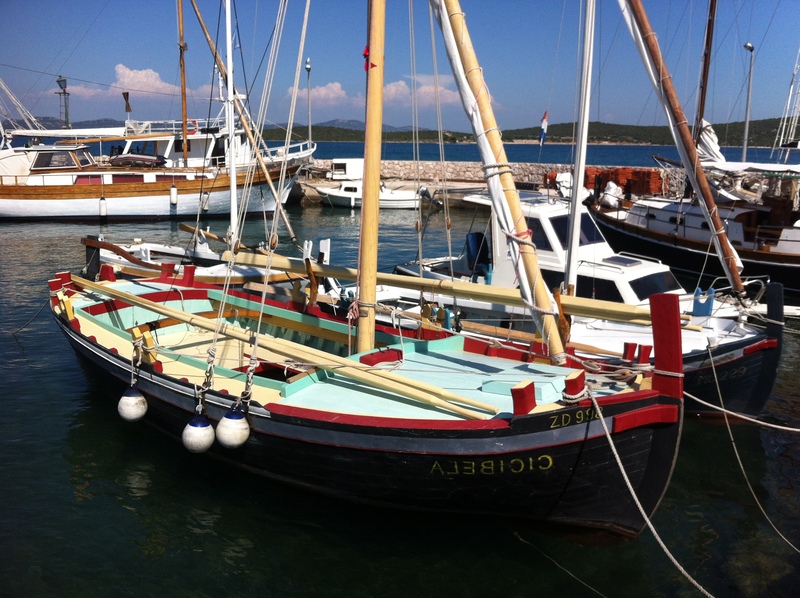 The traditional boat in the islands is called the Gajeta (GUY-et-a). It was, and is to this day, used to transport goods and materials to the islands. The boat is between 6 and 8 meters, has a lateen rigged sail and is a very seaworthy, open vessel that can be used in any weather. I thought that this would be a great trip for students so they could see the importance of the vessel and how it was tied to life in the remote archipelago while learning the values of hard work and cooperation that all farmers and agriculturalist use every day. The Kornati islands are a collection of more than 140 islands spread across only about thirty-six miles. Some islands are big, like the main island Kornat. Others are just drops of land speckled through the sea. 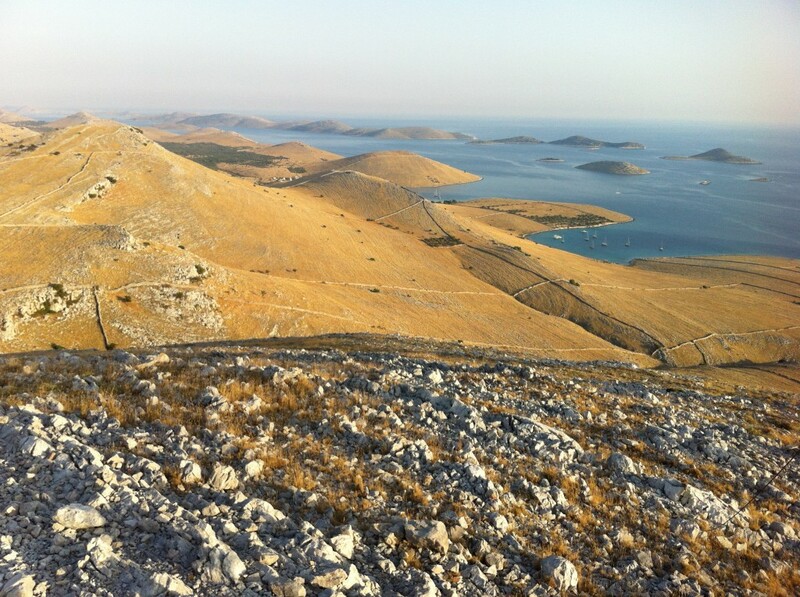 The English writer George Bernard Shaw said, “On the last day of Creation, God wished to crown his work and made the Kornati islands out of his tears, the stars and his breath.” It is an extraordinary place with white rocks, radiant blue sea and golden grasses in stark contrast to one another and each beautiful in own right. Summer is very hot here. That is why we got up so early. We worked on the rugged mountainside for the few cool morning hours before the sun came over the horizon. 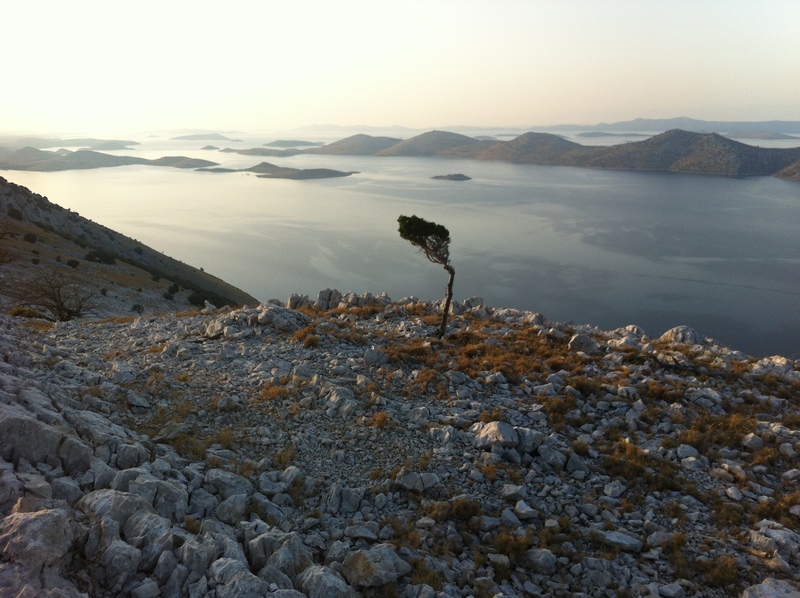 It was enjoyably surreal- still predawn, cutting sage, hundreds of Kornati islands spread around, like Shaw wrote. Thinking about next year, I know the students wont like getting up at four am, but they will love being on the mountainside when the sun comes up as much as I do, feeling transported decades or even centuries back in time. 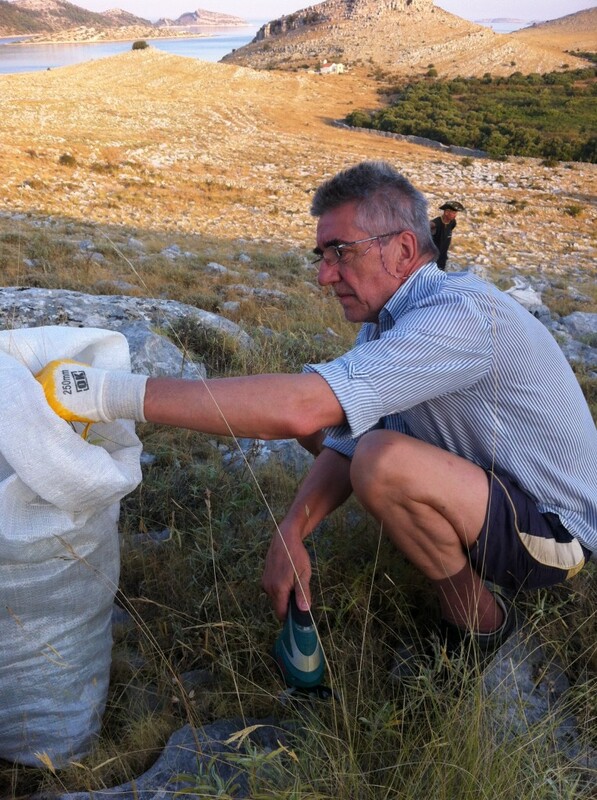 After a few hours we had filled our bags with aromatic sage and headed back to the village. We hopped in our Gajeta and went fishing, catching enough fish for lunch on the shore. It was not even ten am, by eleven o’clock lunch was over. We all found places to rest under the shade of a big pine tree near the water. Here we stayed here for the rest of the day, getting up occasionally to take a swim and cool off. I slept almost all day; feeling accomplished in our early-morning work and sure the students will like it here next year. That restful feeling has a word in Croatian and is part of Dalmatian lifestyle. They call it Fijaka (Fee-yah-ka). My good friend Krešo (Kre-sho) said it translates as “divine waiting for nothing.” With my belly full of fresh fish from the grill, a cool breeze under the pine, and a million-dollar view, following the morning’s work, I understood why there was a special word for just this experience. For centuries traditional vessels were used to get to the islands, work the land, and to fish the productive waters. This summer, our students will sail here to do the same, including cutting fresh sage and preparing it for transport, all the while learning about the traditions of the maritime life in a remote island group.We went fishing again that evening, as we did for the next few sublime days, spent right there collecting sage and exploring in the mornings, enjoying Fijaka for the rest of the day. 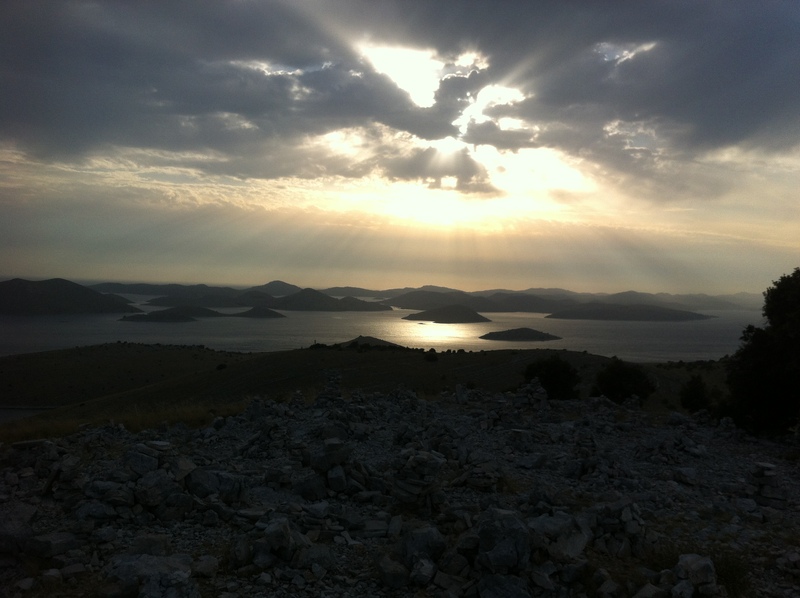 I am so glad to have shared Kornati island life with the Skračić family and am looking forward to our student program with the Gajeta and Zvonko next year.